See all that beautiful produce? 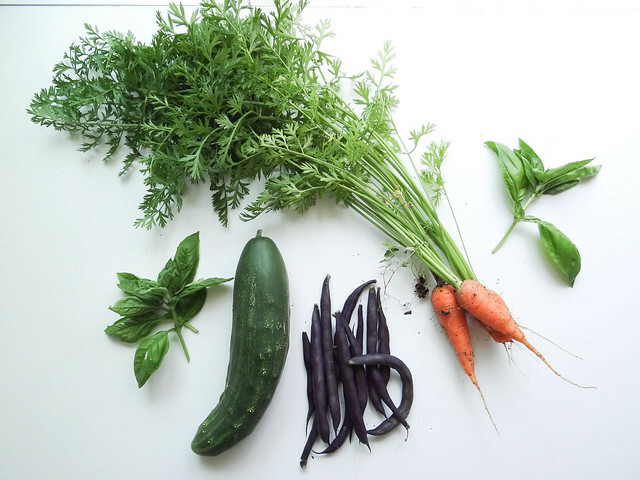 Yup, straight from my garden - I have always considered August to be the peak of the garden season. Flowers are in full bloom with a heady perfume, tomatoes are ripening on the vine, cucumbers, bush beans and carrots are still producing nicely. Tell me, are those royal purple burgundy beans not the most beautiful bush beans you ever did see? This is the first year that I have successfully grown an abundance of basil- in years past it was a hit or miss, most of the basil being enjoyed by the slugs instead of being made into pesto or eaten alongside summer tomatoes. I truly have more basil than I know what to do with, which means I have become a bit more creative where & when I sneak basil into everyday meals. White Bean Basil Hummus, was one answer - a very good one indeed. 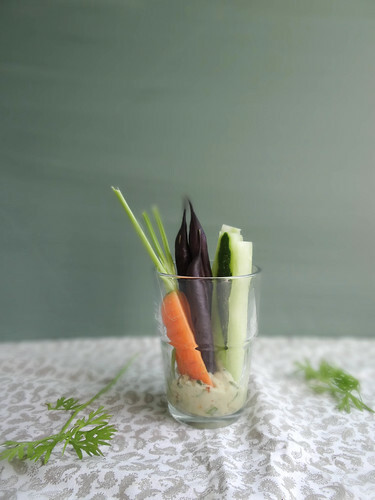 The hummus is the perfect dipper for individual crudites - the hummus is sturdier than a creamy dressing or dip which helps to secure the veggies in place and ensures you get plenty of dip on each veggie. 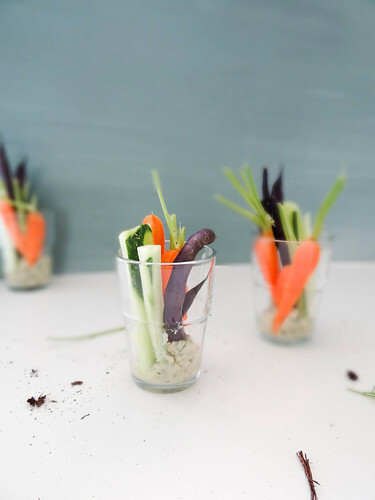 My Gram was a little confused on how these individual crudites work, instead of taking a cup she simply took a few veggies out of the cup...and left the cup, you gotta love Grams'. 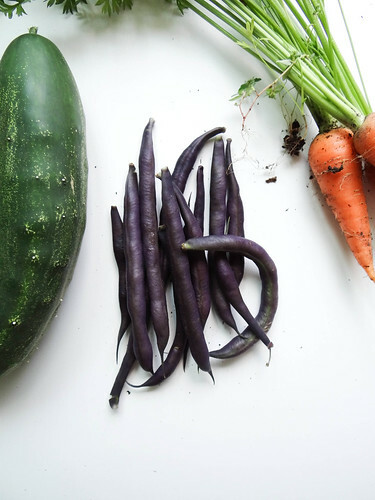 I left the Purple Beans raw, cooking them would have resulted in a loss of that beautiful purple color; if you prefer you can quickly blanch the beans then arrange in the cups. Any mix of veggies work well, in the past I have used mini skewers for 3 cherry tomatoes for each glass - they were super cute. Our book club pick this past month was The Kitchen House, a really good read that I would recommend- the entire group actually enjoyed the book, a rarity that a book receives 100% positive reviews, we have a very opinionated group. The next book club pick is Gone Girl, do any of you have any amazing reads you would recommend or have read Gone Girl or Kitchen House- what did you think? In a food process place all ingredients sans veggies and process until smooth. 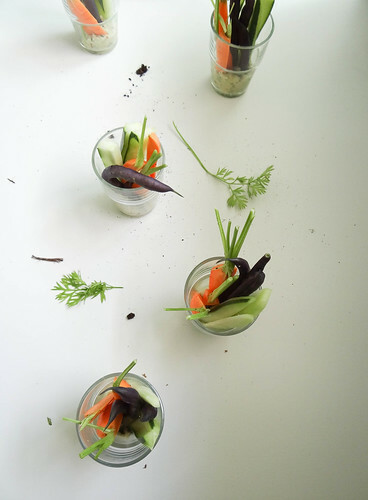 Prep your veggies and cut into easy to eat spears. 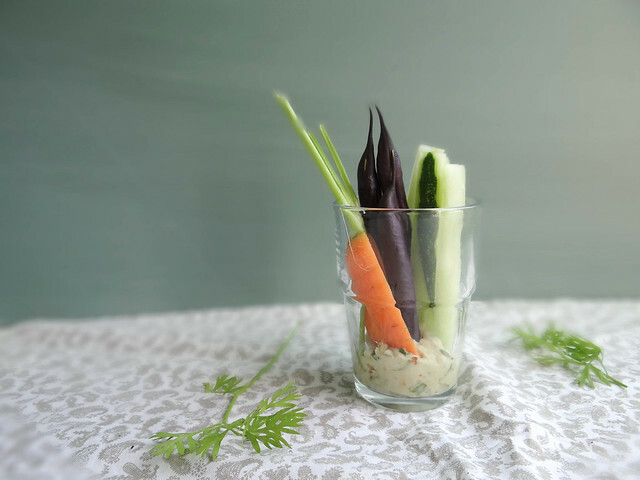 Place about 1 rounded tablespoon of hummus into the bottom of each glass, arrange veggies into the glasses & serve! Leftover hummus is great as a sandwich spread with roasted za'taar eggplant! Oh, man! I loved Gone Girl. Lucky you! You're in for a real page turner. 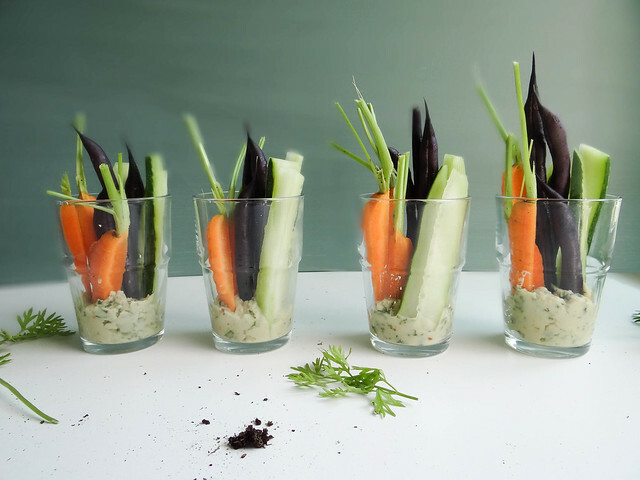 The little cups are super cute, and I especially like the idea of spearing cherry tomatoes. 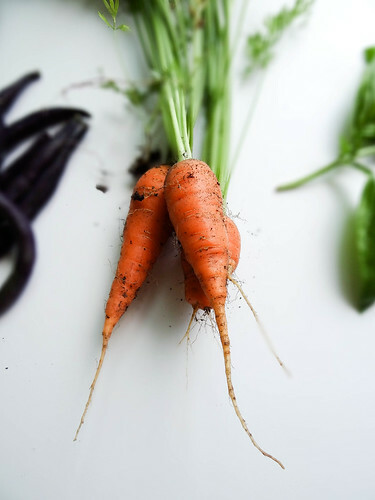 I have always loved having a garden, do you have room at your new place for one? These are stunning! So simple yet so enticing. I love them. Thanks Angie- I love how simple and pretty these are too! Such a great idea Eileen! So pretty. Plus, that hummus is seriously calling my name! 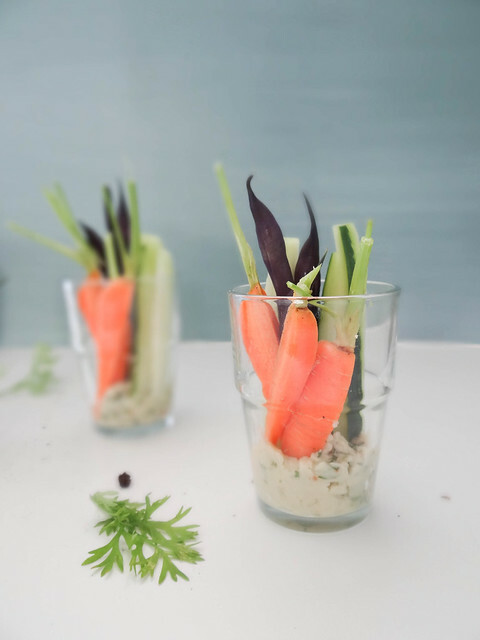 LOVE hummus too, that is one thing I always have in the fridge or ingredients on hand to make a batch! I love that your "Grams" took a few of the veggies out. So fantastic! I was wondering how your book club works and how you got started, would you share a post or two about that? One of my favorite books Into The Free by Susan Cantrell. The sequel is due out next month and I can not wait to get my hands on it. Since I work in a library that won't be too hard!! You should read Unbroken by Laura Hillenbrand in the book club! I was absolutely gripped the whole way through. Your book club sounds like so much fun! 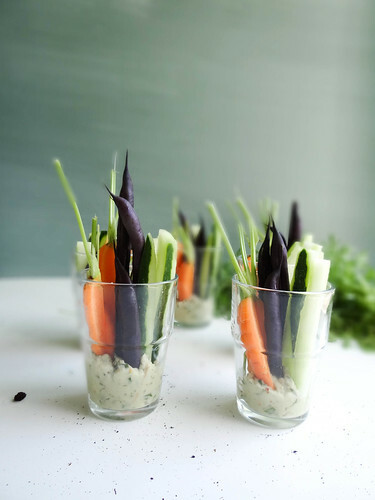 I know these beautiful crudites must have been thoroughly enjoyed by all who indulged. Wow. Doesn't get any fresher and healthier than this. Might make these with the kids. Thanks for an interesting little recipe. Nice! These are great and so easy to make with little ones! Wine certainly makes the conversation interesting, if only you lived closer- you would certainly not go hungry at our book club meetings!